Lesser toe deformities are a common pathology seen by foot and ankle surgeons. There are numerous fixation choices for these difficult deformities. Historically, Kirschner wires have been utilized in maintaining the corrected toe as it goes onto fusion or stable resection arthroplasty. K-wires have several inherent risks, documented well in the literature, which has led to the development of the intramedullary implant. The one-component metallic implant has become the mainstay treatment for complex hammertoe deformity. 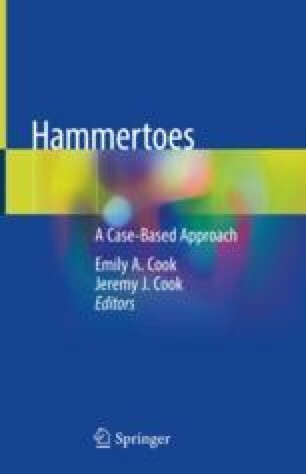 The purpose of this chapter is to highlight the development of the one-component metallic hammertoe fixation prosthesis and explore the advantages and disadvantages of the individual systems.